A look at the crystallites of AZT, the first antiviral approved for the treatment of HIV/AIDS. Originally, AZT was created to treat cancer — but it failed in tests. When you pop a pill, do you know how it works? Most modern drugs target specific molecules, interacting with disease at the molecular level. But while we know the molecular causes of roughly 4,000 diseases, a very slim 6 percent of those diseases have a safe and effective drug to treat them. Why? Because of the incredible difficulty and cost of finding a compound that is perfectly shaped to interact with a molecular cause, and that also happens to be safe. Francis Collins, the Director of the National Institutes of Health, wants to help this process along. 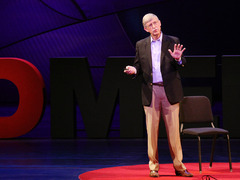 Francis Collins: We need better drugs -- now In yesterday’s talk, given at TEDMED 2012, Collins makes a bold case for translational research to produce better drugs, faster. What does “translational” mean? It means research that takes a particular look at basic scientific discoveries and asks: how can we make an actual medicine from this? To that end he helped launch the NIH’s National Center for Advancing Translational Sciences in 2011. NCATS aims to do away with the costly and time-consuming bottlenecks that prevent new drugs from coming to market. Collins hopes to encourage pharmaceutical companies to open up their stashes of drugs that have already passed safety tests, but that failed to successfully treat their targeted disease. He also wants to look at how drugs approved for one disease could successfully treat another. We can teach “old drugs new tricks,” Collins says in his talk, by matching them to the molecular pathways of other diseases. Doing so will require academia, the pharmaceutical industry, government agencies and patient advocacy groups to work together, in conjunction with talented researchers and ample funding. After all, a single drug can cost billions to develop. Still, it’s possible. In his talk, Dr. Collins mentions two failed cancer drugs that were successfully repurposed: zidovudine (AZT), the first antiviral approved for HIV/AIDS in 1987 and, more recently, farnesyltransferase inhibitor (FTI), which was used to successfully treat children with the rapid-aging disease Progeria in a 2012 clinical trial. Raloxifene: The FDA approved Raloxifene to reduce the risk of invasive breast cancer in postmenopausal women in 2007. It was initially developed to treat osteoporosis. Thalidomide: This drug started out as a sedative in the late fifties, and soon doctors were infamously prescribing it to prevent nausea in pregnant women. It later caused thousands of severe birth defects, most notably phocomelia, which results in malformed arms and legs. In 1998, thalidomide found a new use as a treatment for leprosy and in 2006 it was approved for multiple myeloma, a bone marrow cancer. Tamoxifen: This hormone therapy treats metastatic breast cancers, or those that have spread to other parts of the body, in both women and men, and it was originally approved in 1977. Thirty years later, researchers discovered that it also helps people with bipolar disorder by blocking the enzyme PKC, which goes into overdrive during the manic phase of the disorder. Rapamycin: This antibiotic, also called sirolimus, was first discovered in bacteria-laced soil from Easter Island in the seventies, and the FDA approved it in 1999 to prevent organ transplant rejection. Since then, researchers have found it effective in treating not one but two diseases: Autoimmune Lymphoproliferative Syndrome (ALPS), in which the body produces too many immune cells called lymphocytes, and lymphangioleiomyomatosis, a rare lung disease. Lomitapide: Intended to lower cholesterol and triglycerides, the FDA approved this drug to treat a rare genetic disorder that causes severe cholesterol problems called homozygous familial hypercholesterolemia last December. Pentostatin: This drug was created as a chemotherapy for specific types of leukemia. It was tested first in T-cell-related leukemias, which didn’t respond to the drug. But later NIH’s National Cancer Institute discovered that the drug was successful in treating a rare leukemia that is B-cell related, called Hairy Cell Leukemia. Sodium nitrite: This salt was first developed as an antidote to cyanide poisoning and, unrelated to medicine, it’s also used to cure meat. The National Heart, Lung, and Blood Institute is currently recruiting participants for a sodium nitrite clinical trial, in which the drug will be tested as a treatment for the chronic leg ulcers associated with sickle cell and other blood disorders.